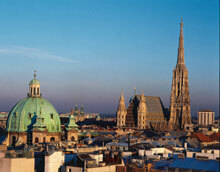 Vienna is the capital of Austria and one of Europe’s most charming cities. Situated in the Northeastern part of Austria, Vienna is a city of many faces: cosmopolitan and nostalgic, extravagant and provincial, exciting and peaceful. Elegant Art-nouveau hotels as well as small romantic hotels offer all amenities a traveler expects in a metropolis. Spending just a weekend or your entire vacation in Vienna; you won’t get bored. Beautiful historical buildings, plush coffee houses, wonderful operettas and a ride in the Fiaker are just a few of Vienna’s highlights.